The exhibition “Southern Voices” explores the response by Southern authors to the most virulent and bloody period in American History. An estimated 750,000 soldiers died during the Civil War, more than any war in U.S. history, and the fundamental issues that were central to the conflict--slavery’s economics and political control of that system – are the root of many of the problems we face in American today. “Southern Voices” examines the work of southern authors from three distinct periods. During the Civil War era there was a significant amount of poetry and fiction by supporters of the Union and the Confederacy. This exhibition displays work from some of the South’s most strident defenders, but also from writers who spoke on behalf of abolition and the Union cause. During the Reconstruction period, southern literary figures began to refer to the Civil War as “the lost cause,” and portrayed Confederate soldiers and political leaders as figures protecting a noble way of life. Finally “Southern Voices” displays work from late-19th century authors, through the Jim Crow era of the twentieth century, and even beyond. These range from depictions of a romanticized antebellum South which ignored the immorality and brutality of slavery, to efforts which portray a more realistic, unvarnished view of this divisive era of American history. 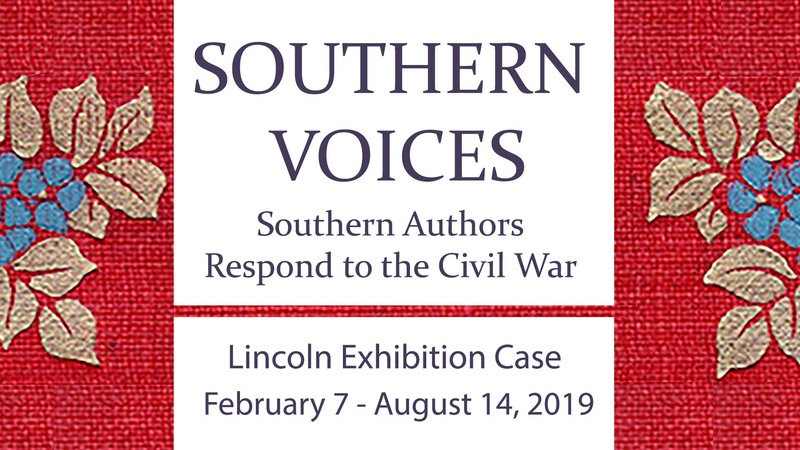 “Southern Voices” features work by a variety of authors including Augusta J. Evans, Margaret Junkin Preston, and Bill Arp, all of who were ardent supporters of the Confederacy and twentieth century Southern authors Margaret Mitchell, Allen Tate, William Faulkner, and William Styron. Also included in the exhibition are books by Southern-born African American authors who spoke out passionately against slavery, notably Frederick Douglass, William Wells Brown and Frances Ellen Watkins Harper.